This is my first tournament report ever. I am going to tell you about my experience at the spanish nationals in Madrid. I won the event. 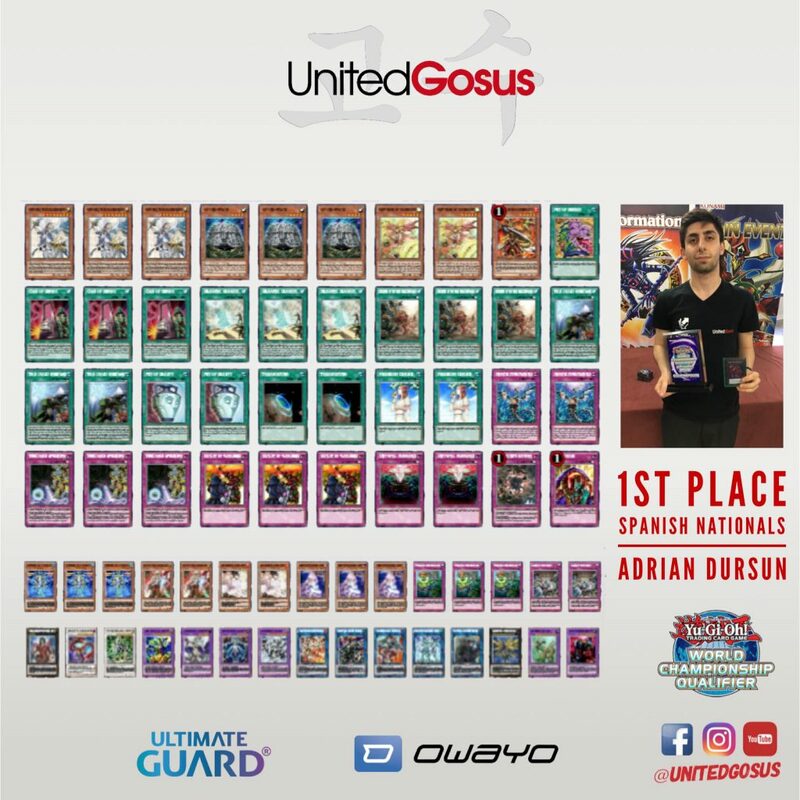 The reason I played that nationals and not the german nationals is because, about half a year ago, our teammate Steffen Eichelberger convinced me to try to judge the german nationals and play the Spanish nationals. A long time passed and eichelo realised that he could no longer play at Spanish nationals. Also, I did not get accepted as a judge for the german nationals. Meanwhile, Galo Orbea told us that he is going to play Spanish nationals. Since I had never been to Spain and I really like the current format, I decided to travel alone to Madrid and meet Galo there. This would give time to see him again and play the nationals together. I arrived at the airport on friday evening. For the first 30 minutes I felt lost. Because I’m not able to speak more than 5 words of spanish, it was harder than I originally thought to buy a metro ticket. I just had to meet Galo, he was able to help me a lot over the weekend. We met at the gran via and had dinner together. After that, we went to his cousins apartment to build our decks. We had talks about the ratios of my Draco deck, such as: should we play 2 or 3 Master Peace?, 2 or 3 Duality?, Waking the Dragon? It was endless, but finally we had decided on a good build at 3am and finally went to sleep. On the Saturday, we traveled together to the venue. I felt super tired, yet galo was super energised that morning. I could not believe how much energy he had with just 4 hours sleep. At the venue we picked up the last cards for our decks and at 11:30AM the first round started. Infernoid, Dice Roll: Won Game 1 : I started with Maiden, Apocalype, Antispell and Chalice. He was not able to do anything. Game 2 : He bricked, I bricked. I sided one random Waking the Dragon. The opponent summoned Patruela and used his effect an rolled a dice when I had three brackrow, he hit the Waking, I summoed Last Warrior and he couldn’t out him. Game 1 : He started with beatrice and searched a tour guide with scarm. I summoned my Amano Iwato and popped his beatrice. He tried to comeback, but after 2 turns I gained enough advantage that he was not able to get back into the game. Game 2 : He started with Beatrice, 2 backrow and a Searched Tourguide. In my turn, he flipped his Anti-Spell-Fragrance. I set all my cards, then he used Twin twister on my set Card of Demise and my Diagram. Game 3: I let him start, he summoned 2 Ba’s and I used Cherry to banish his Dantes. After a few turns he realized he is not able to win without Dante, so he conceded. 2x Gate Zero, Wisdom eye and Darkwyrm. He used his Wisdom Eye and Gate 0 to get into Electrumite and I used my Infinite Impermanence from my hand to prevent a strong board. My opponent was not able to go into a strong board after my handtrap, so he passed his turn. I broke his board and passed with Master Peace + Rivarly, no comeback for him. Game2 : My Opponent Started with Chronograph + Normal Summon, I used my cherries to banish his Electrumites. He went into Omega+ Dweller. I set one, Summoned maiden, set 1 Draco Trap+ Rivarly. He was not able to break that board. Draco Demise, Dice Roll: Lost. Game 1 : My opponent went first. He didn’t know that I was also playing Draco. He chose to add his Floodgates like Monarchs Erupt and Rivarly and Passed his turn with Maiden, 5 Backrow+Diagram. I set a draco spell and one draco trap card, tribute summoned my master peace and popped 1 backrow and his maiden. Afterwards I activated heritage to draw into 3 more cards, then summoned another master peace to nuke his whole board. He went into game 2. Game 2 : I was confused that my opponent went first again. He set, summoned maiden with 3 backrow and diagram. In my standby he flipped anti-spell-fragrance. I set a draco spell and a draco trap to summon master peace and destroyed the whole board except anti-spell-fragrance. He had no comeback options. Game 1: My opponent bricked and wasn’t able to get into his plays. After the first turn he conceded because I was able to play. Game 2: He let me start, I set waking the dragon and passed my turn, my opponent thought its a draco tribute trap so he used Cosmic Cyclone during the standby phase. I summoned Raidraptor Ultimate Falcon, my opponent scooped after that. Game1 : I let my opponent start because he had no extra deck. He played his first turn with a basic draco board: maiden, a draco trap, a floodgate and 2 other backrow. I set 2 cards and summoned masterpeace and he was not able to go into any plays. Game2: I started with 3 Monsters + Demise , I scooped after a Master Peace hit his field. Game3: I let my Opponent Start. He ended with 5 backrow, MasterPace unaffected by monster and traps and Diagram. I went into the battlephase and used Evenly Matched. He kept his Master peace. I set 1 card and in the end phase he destroyed it. It was a Waking the Dragon, so he lost that game. Game 1 : I started game 1 with Maiden and Floodgates. He had no plays. Game 2: He let me go first. I summoned a master peace and had Cherries in hand. He kaijud me and summoned a few pendulum monsters. After I used the cherries, he went into Ignister to shuffle the last card I had back and this let him pop my diagram as he destroyed his purple poison. Game 3: I let him start, he didn’t make a good board. I destroyed everything and got evenly matched. I just kept a rivarly. Two turns later I flipped the rivalry, but I got red rebooted and OTK’d. I was shocked that I had to play against my only Teammate in the tournament in Swiss. But we had to play. Game 1: He FTK’d me. Game 2: I let him start due the reason I knew he would side out the FTK and assumed he thought I will start and hoped that he draws into reboots and other dead cards. He was not able to build a big board. I asked after his turn if he ever got OTK’d by a True Draco player. He replied with a no. Afterwards, I summoned 2 Master Peace and a Ignis heat to OTK him. Game3: I was unsure if he lets me Start or not, so I decided to keep my Handtraps in with a few floodgates. He let me start and I opened Ogre, Cherry, Master, Heritage and rivarly. I summoned ogre and tributed Heritage with ogre for master peace. Then I set Rivarly. After the cherries resolved he wasn’t able to make a good board, so I won that match. Spyral, Dice Roll : Won Game 1: I started with maiden + anti-spell and a few backrow. He tried to use Agent from hand and guessed Spell. I revealed a Master Peace on the top of my deck and he scooped. Game 2: He established a Board, but that board wasn’t able to do anything against the normal summon of Amano Iwato. I won that Match. End of Swiss, I got 2nd Place and Galo got 13th place. Game 1: I lost because I was not able to break his Board. Game 2: I Let him start and cherried him, he wasnt able to establish a big board so he lost. Game 3: He went first again and he bricked. Javier Martinez, Altergeist. During my top8 match I got my third Deck check. After 10minutes, the Judges came back and my Opponent got a game loss for having cards in his deck box, which were not a part of his deck. Game2: He started and bricked. He then lost to Amano Iwato Beatdown. Alberto Selas, Spyral Dice Roll: Won. Overall it was a good event. I met a lot of new people, the community in Spain was great. I had a lot of fun during these days. I would like to thanks the whole of team United Gosus, all my friends who supported me, everyone who helped me get cards and of course, Galo Orbea. He motivated me since round 3, saying that I have to win the event. I had a great weekend with him. Also, I would like to give a shoutout to our Sponsors: Ultimate Guard and Owayo.